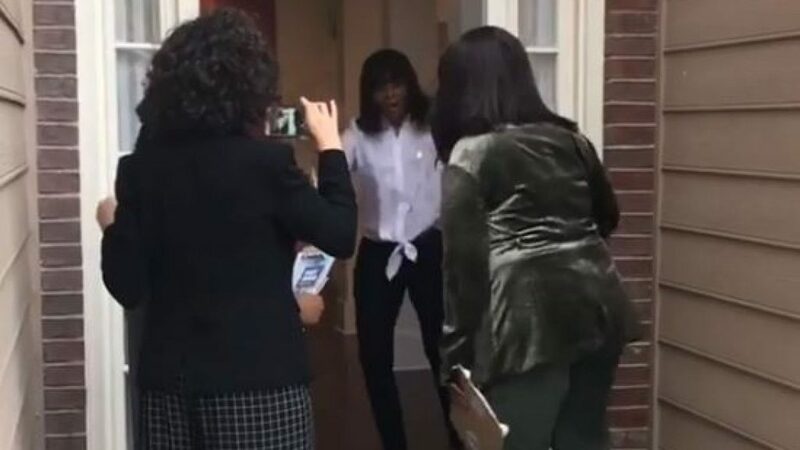 Oprah Winfrey has been knocking on doors to get voters to make history by backing a black female Democrat to become Georgia’s governor. Winfrey is campaigning for Stacey Abrams, 44, in the Republican-leaning state of Georgia to become America’s first black female governor. Sky News’ US correspondent, Amanda Walker, said: “You know that it’s getting close when you have these big names coming out to campaign. The actress and talk show host, 64, gave a rousing speech to Democrat supporters ahead of next Tuesday’s vote in which she called Ms Abrams a “changemaker”. Speaking to a mostly female audience north of downtown Atlanta, Winfrey said: “I am here today because Stacey Abrams cares about the things that matter. “I’m here today because of the men and because of the women who were lynched, who were humiliated, who were discriminated against, who were suppressed, who were repressed and oppressed. Winfrey, who rarely makes political endorsements, said she is a registered independent who was not in Georgia at anyone’s request. She explained she tracked down Ms Abrams’ mobile phone number and called her to say she wanted to offer assistance in the final days of the campaign. “I paid to come here myself, and I approved this message,” she said to cheers. She encouraged women of all races – “sisters not just ‘sistahs'” – to remember they would have been “just a piece of property” with no ballot barely a century ago. The TV star hit out at Republican adverts, which she saw in her hotel room, saying Ms Abrams was “too extreme” and “too radical” for Georgia. She said the ads were “noise…designed to confound you with fear”.